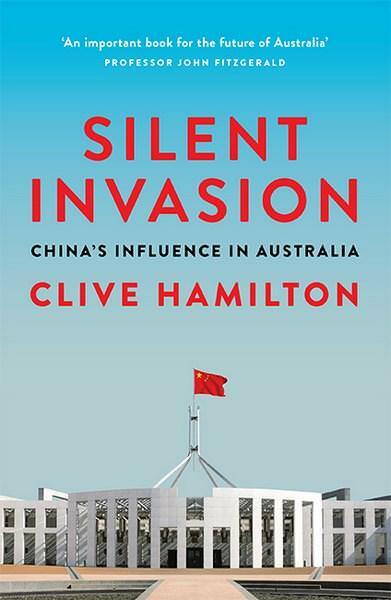 It's telling that I don't even have to have read Clive Hamilton's controversial book The Silent Invasion: China's Influence in Australia to be pulled into multiple loud conversations about it. I have been following the various arguments, and there appears to be two key types of conversations that have emerged. First, there are the ones that cover issues of political influence and surveillance, the 'nationalist' segregation of groups in Australia, and the extent to which the Chinese Communist Party may be compromising Australian democracy. The second set of conversations address the inflammatory (some say racist) language used in the book and by Hamilton's proponents, the fact that White Supremacists have embraced the publication, and the tendency by many to conglomerate Chinese groups into one sinister mass. Both these types of conversations address important issues for debate. Neither of them should shut the other one down. The debates I have seen on social media are typically hyperbolic and unfortunate. Unfortunate because, while no-one expects nuanced discussions on Twitter, the name-calling does none of the participants any favours. There have been repeated, knee-jerk accusations against those who contested Hamilton's views or language of being Chinese spies and 'plants'. The threads then degenerated into tedious political partisanship. What does become apparent is how entrenched 'yellow peril' rhetoric is in the way people talk about China and 'the Chinese'. Frank Bongiorno wrote a sharp, complex piece for Inside Story that summarises many of the problems with the language Hamilton uses. Considering Australia's anti-Chinese history and contemporary panics about being 'swamped by Asians', paying attention to language and terminology is important. "These are not problems with China or 'the Chinese' per se. These are pressing problems about opposing political philosophies and a country's ability to exert influence that is deemed undesirable." It is regrettable that Hamilton himself appears ready to dismiss any criticism of his work as doing the work of the Chinese Communist Party (CCP). He argues that the detrimental effects of his somewhat lurid writing are 'collateral damage' that Chinese-Australians are willing to take. It's useful to consider the definitions and complex concerns outlined in the first and second Open Letters that have been submitted to Australia's parliamentary review of new national security legislation by various Asian studies and specifically China studies (including Chinese diaspora) scholars. The legislation does not necessarily focus on China but many have taken it as a key element. These statements reveal what's at stake in this debate, and it is considerable. Bongiorno summarises Hamilton's book as 'a plea to Australians to resist Chinese interference in their democracy'. I would suggest that we need to talk seriously about any interference in our democratic processes and society, and the 'Chineseness' of the threat is to a great extent an unnecessary qualifier. If it's the case that the 'Chineseness' of the threat is very much a necessary qualifier, then we may be talking about something other than threats to democracy. Surveillance and coercion of recent China-origin groups and their families in Australia is real and documented. The conservatism of some — not all — students from China and their consequent suppressive political stances has real, negative effects in our university classrooms. The influence of the CCP in Chinese language media in Australia (and Australian media in China) is clear. Then there's the competition among our universities to cultivate mainland Chinese partners without due regard for potential conflicts of interest. To me, these are not problems with China or 'the Chinese' per se — these are pressing problems about opposing political philosophies and a country's ability to exert influence that is deemed undesirable. I hope the passionate discussions around these issues continue, with attention paid to the damage done when one is sensationalist in tone and language. You don't need to sound like a 19th-century issue of The Bulletin to make your point. If the "Chinese" really are influencing Australian politics, then the problem surely is with the Australian politicians that they can influence. Of course real influence on Australian politics has been carried on by others, the British, for example. They appear to have influenced the dismissal of Whitlam and are still not willing to make public the exact nature of that influence. Well said. I was unaware of the book, & will certainly not be looking for it. The points you raise, distinguishing between interference in our (ahem) democracy, & a particular set of people undertaking such an exercise, IE people who are not like us, is so telling of the state of mind of my people. I aspire to a little nuance in my tweets - don't always manage it. Glad to know you're in the world.